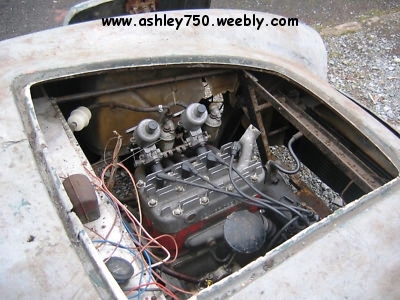 This Ashley 750 was sold in March 2011 on eBay, but the sale fell through and it was back on eBay in April 2011 when it sold for £3750 that was £600.00 less than previously, (good for the new buyer, not so good for the seller). I tried to get the contact details for the new owner but got no reply from the seller, so if the present owner see's this please email me with details of the cars progress. At the time of the sale the car was located in Ferryside, UK. 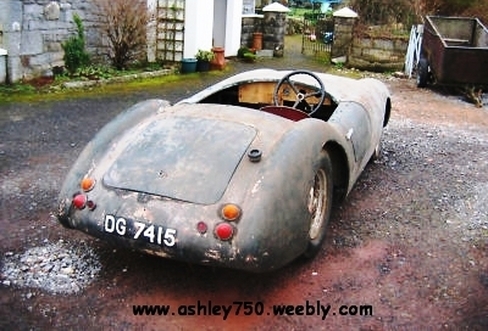 A 1933 Austin 7 based Ashley 750 Special for restoration, complete with V5 and it's old buff logbook. Car has a rebuilt engine with Cambridge cylinder head, twin carbs, tubular manifold, etc. I have had it turning over and it is showing good oil pressure. The gearbox is four speed with a remote shift. Wheels are 15", it rolls and the handbrake is working! The chassis has extensions on the front and rear to support the body and allow telescopic shock absorbers to be fitted. The front suspension is the twin spring type, king pins have been renewed and the brake cylinders look new too. 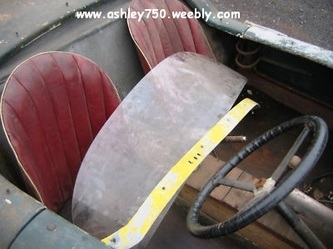 There are two seat backs but no bases, the pretty perspex screen is with the car. 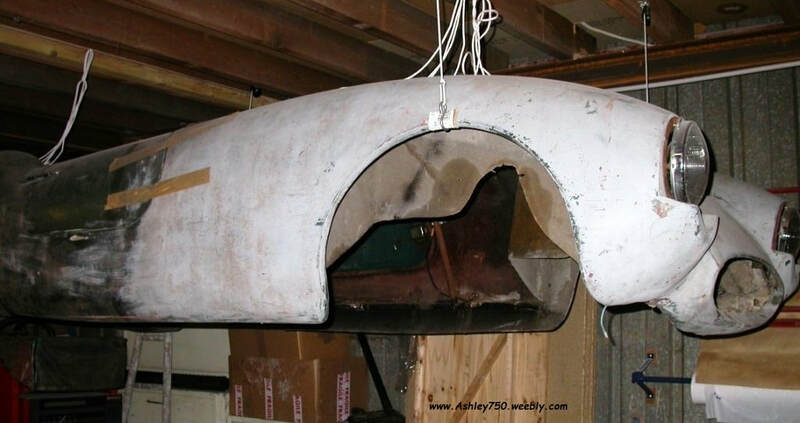 Bodyshell will need work, but is not beyond repair. I have had the engine running, it runs well, although the starter motor is in need of a rebuild! 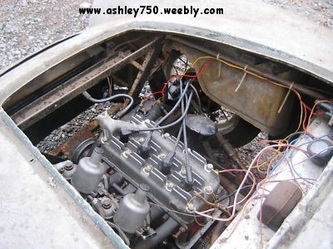 The clutch operates and the car moves under it's own power! a decent amount of cash, too much I would think for it to just disappear. I own the Ashley registered DG 7415. The restoration of the car is nearly complete. The body is being painted now in Green colour. ﻿July 2014﻿ that I rediscovered the Flickr page and emailed Philippe to see if the Restoration was complete as there had been no new photo's added. Before sanding back and respraying with primer coats. This next set of photo's shows the restoration works completed on the Motor/gearbox/transmission and axle's and then their assembly into the restored Chassis. I received a reply to my email from Philippe a few days after sending it, yes he still has the Ashley, its bodyshell has been reunited with the chassis and is awaiting some attention from the spray gun, other commitments have had to take priority, but he hopes to continued later in the year and will keep me updated with his progress. 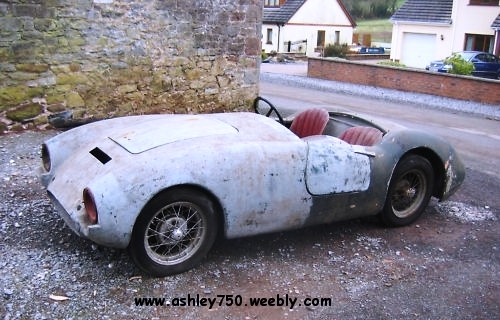 So keep looking in to see the finished restoration. I was away, this is why I am late to reply. I will deeply answer you this weekend and I will send you next week more detail pictures for your website. maybe it's still hanging from his workshop roof.